(Interfax – MOSCOW, June 7, 2013) President Vladimir Putin’s press secretary Dmitry Peskov has dismissed rumors that Putin will re-marry soon after divorce. “There is no other woman in the president’s life,” he said on Ekho Moskvy radio, noting that one should look at Putin’s busy schedule. “It is easy to understand that his life is in no way connected with family relations,” says a posting on the radio station’s website, citing Peskov’s interview. “Even an accidental person will understand, looking at Putin’s schedule, that his life is not connected with any family relations in any way, unfortunately. It is entirely centered on his duties and responsibilities as president,” Peskov said. On whether Russia will see a presidential wedding any time soon similar to Nicholas Sarkozy’s in France, he said, “I don’t think answering such questions is within the presidential press secretary’s responsibilities. But I can say for sure that these are mere speculations and rumors rather than anything else,” Peskov said. He declined to speculate on when the Putins’ divorce could be finalized. “It is a formality. Then again, let us leave this to Vladimir Vladimirovich and Lyudmila Alxandrovna. It is absolutely their private affair,” Peskov said. 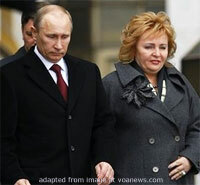 Vladimir and Lyudmila Putin announced on Thursday evening that they had decided to separate, but their divorce was not yet finalized.